In the inaugural Ultimate NHL Playoff, Anaheim’s representative made a nice run all the way to the Quarterfinal. This time, the ’05-’06 Mighty Ducks of Anaheim, in their UNP debut, could not match that run. 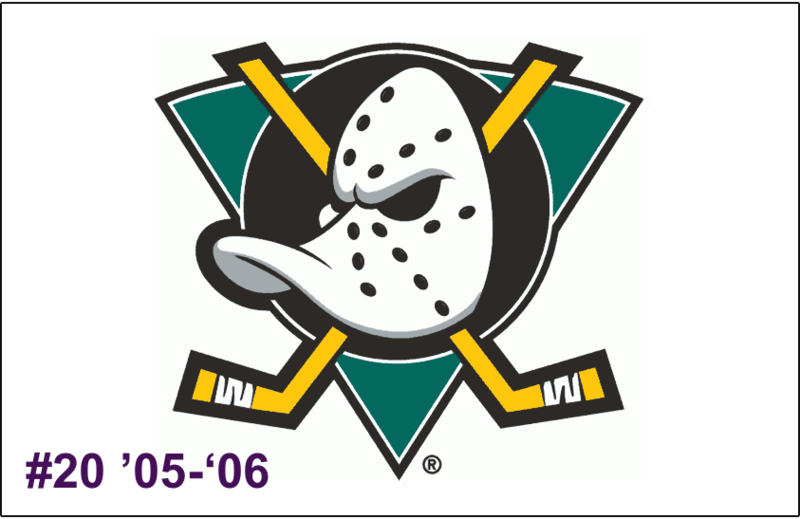 The ’05-’06 season was the final year of the Mighty Ducks of Anaheim. The following season they underwent a slight name change to what they’re known by today, the Anaheim Ducks. It was a good final try for the Mighty Ducks as they finished with a record of 43-27-12 under head coach Randy Carlyle, which was put them 3rd in the Pacific Division. The Mighty Ducks were right in middle of the league in scoring at 3.10 goals per game while they were 8th defensively, allowing 2.79 goals per game. Hockey Reference gave the ’05-’06 Mighty Ducks the 11th-toughest schedule and their SRS had them as the seventh-best team in the league. Anaheim made the playoffs as the 6th-seed in the Western Conference and after falling down 3-2, won Game’s 6 and 7 to advance to the Conference Semifinal. They then swept the 7th-seeded Colorado Avalanche to advance to the Conference Final for just the second time in their history. However, they came up against a team fated by destiny in the 8th-seeded Edmonton Oilers and fell in five games. Teemu Selanne, legend, led the Mighty Ducks in both goals and points with 40 and 90, respectively. Andy McDonald was second behind Teemu in both with 34 goals and 85 points while he led Anaheim in assists with 51. Teemu was also tied for second in helpers with captain/defenseman Scott Niedermayer at an even 50. Noted tough guy Todd Fedoruk led the Mighty Ducks in penalties in minutes with 174. Second behind him was longtime Duck Ruslan Salei with 114. who was one of the tragic losses in the 2011 Lokomotiv plane crash. Anaheim had some good goaltending from both their netminders and both saw playing time in the playoffs. Jean-Sebastien Giguere was the main starter with 60 appearances as he posted a 30-15-11 record to go along with a 2.66 goals against average and a .911 save percentage. Backup Ilya Bryzgalov saw time in 31 games during the regular season and posted a 13-12-1 record with a 2.51 goals against average and a .910 save percentage. “Jiggy” posted the highest Point Share for the Mighty Ducks at an even 12.0 while Teemu was a close second at 11.4. Despite falling short in the playoffs, the Mighty Ducks did have some silverware as Selanne was awarded the Bill Masterson Trophy for his performance during the season, which was quite remarkable after how his career was looking right before the lockout. Up next are the 19th-seeded ’10-’11 Carolina Hurricanes! This entry was posted in Offseason, Ultimate NHL Playoff and tagged Andy McDonald, Chris Kunitz, Corey Perry, Francois Beauchemin, Ilya Bryzgalov, Jean-Sebastien Giguere, Joe DiPenta, Joffrey Lupul, Jonathan Hedstrom, Keith Carney, Maxim Kondratiev, Mighty Ducks of Anaheim, Offseason, Randy Carlyle, Rob Niedermayer, Ruslan Salei, Ryan Getzlaf, Samuel Pahlsson, Scott Niedermayer, Sean O'Donnell, Teemu Selanne, Todd Fedoruk, Todd Marchant, Travis Moen, Ultimate NHL Playoff, Vitaly Vishnevski. Bookmark the permalink.